The Cavendish variety accounts for over 90% of Australian production and has a loyal following amongst consumers. The industry often produces more fruit than the markets require and prices can be poor for extended periods. 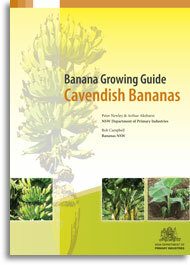 This is reflected in the wide range of prices for Cavendish bananas in wholesale markets from season to season. Growing quality bananas all year round in a sub-tropical climate is not easy. As well as pests and diseases, environmentally induced problems, such as chilled fruit during winter and November dumps have to be managed. These challenges can be met, and this Grower Guide is one step towards seeing Best Practice adopted in the banana industry. The Guide is available for download below complete or in sections.